The Uncharted series has always been known for its elaborate action set-pieces and phenomenal character writing. Its newest installment, Uncharted: The Lost Legacy, takes a slight step back from what we’ve seen previously. It’s a far more compact experience, and focuses on two characters that not many people might have thought would pair up with one another: Chloe Frazer (first appearing in Uncharted 2), and Nadine Ross (who debuts in Uncharted 4). As soon as I heard that Naughty Dog was creating another Uncharted game after Uncharted 4: A Thief’s End, I was instantly sold. They are masters of their craft, and I had no doubt that they would create another fantastic title. And while I only expected more of what made the previous installment great upon going in, I ended up still being blown away by what the team at Naughty Dog had accomplished. Uncharted: The Lost Legacy is a tighter, smaller experience than any other game in the series’ lineage. It improves upon the last game’s previous mechanics a lot, yet still manages to fit so much passion and heart into a 7-8 hour experience. One of the most controversial changes to the game was that the famous lead, Nathan Drake, wouldn’t appear in this game. The game’s two leads could not possibly have had more differing personalities. While Chloe serves as a great replacement for Nathan Drake, she shouldn’t be perceived as just being that. She is a fantastic character in her own right: sarcastic, quick-witted, strong, smart, and multi-dimensional in a light that is so refreshing to see a female character placed in. Nadine isn’t as easy going though. She comes from a mercenary background, and it shows in her demeanor; she is more hardened, and some aspects of her past still haunt her, causing her to always keep people at arm’s length. While Chloe and Nadine might feel a bit incompatible at the beginning, it is so intriguing to see how naturally their relationship develops throughout the game, as they share moments of laughter, friendship, and even somber silence and tension. 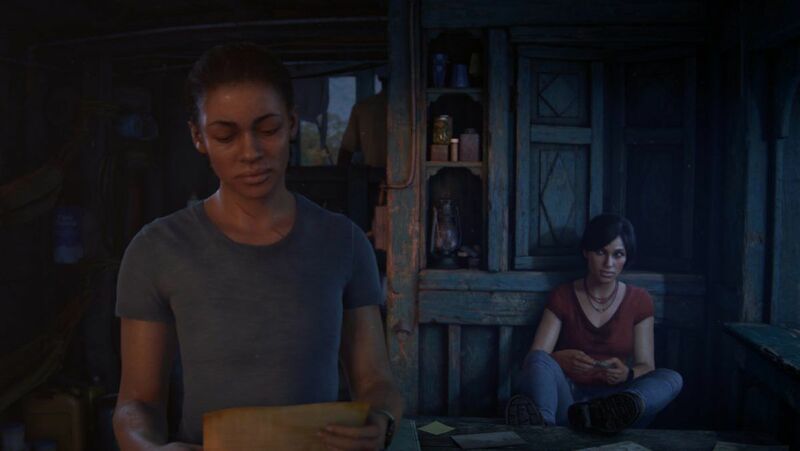 Naughty Dog’s writing has always been superb, but nothing is more indicative of the development team’s skill, than the relationship between these two characters. By the end of the game, you’ll realize you were wrong to ever think you’d miss Nathan Drake. This visuals are breathtaking. It should go without saying at this point, but the lush jungles and ruins of India are beautifully realized, with vast greenery, shrines and monuments placed throughout the world. Also, this game holds what Naughty Dog considered to be an accomplishment worth bragging about: the single largest level in the series’ history. The Western Ghats are vivid and teeming with life, presenting the player with the freedom to move at their own pace, while still providing enough constraint to not overwhelm you with too many activities to get lost in. 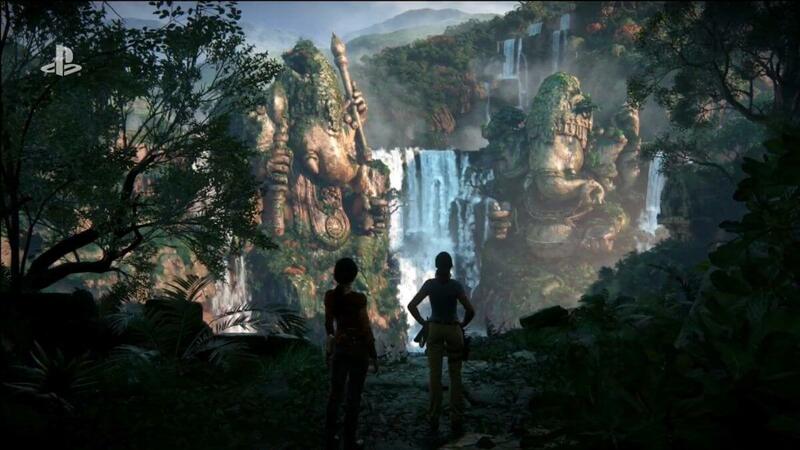 Taking the time in the Western Ghats to search for treasures and solve puzzles (the absolute toughest in the series to collect, by the way) is immensely rewarding, providing you with additional dialogue to help flesh out the relationship between Chloe and Nadine. But while the game is at its best when you take your time, it isn’t necessary, and the game still flows perfectly even at its fastest pace. If you’ve played Uncharted 4, the gameplay mechanics largely remain the same. Shooting is tighter than ever, while climbing and swinging around on your rope are still very much an integral part of progressing through the world. Hand-to-hand combat is a lot more inconsistent than it’s ever been, however. You have access to a few different buttons now, for things like dodging and countering; but the timing can be frustratingly hard to pull off, and it can lead to some really awesome animations looking clumsy and out of place. Performing a dual takedown with Nadine when she’s fighting next to you is one of the coolest things you can do though, and is so seamless and satisfying when it’s executed. The openness of the world allows for some really interesting combat scenarios, where you can practice stealth or go in guns blazing. The Lost Legacy contains some of the best AI that the series has seen, and I never felt like I got away with fooling my enemies too easily. 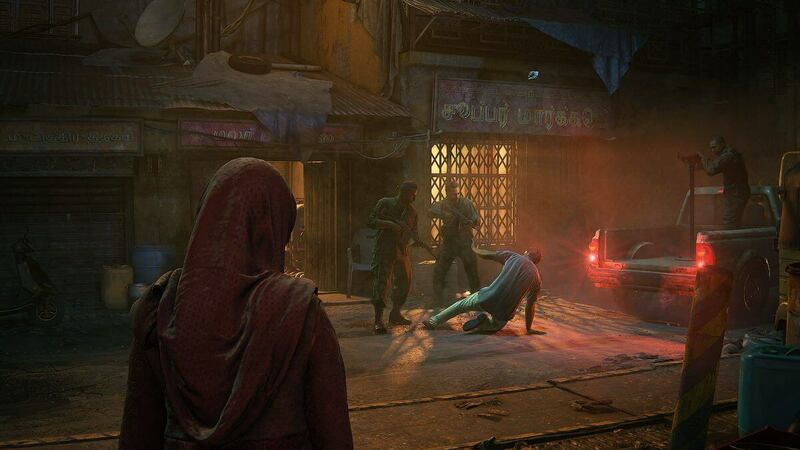 Whether you go in guns blazing or pick enemies off one by one, Lost Legacy never forces you into using a certain tactic. The game will quickly throw a tutorial your way from time to time, but ultimately you choose how you want to play. It’s hard to talk about any Uncharted game without talking about the incredible action set-pieces. Rest assured that while the overall experience is smaller and more focused, the action doesn’t let up whatsoever. The game has some of the most stunning and exciting action sequences I’ve ever seen, incredibly well-choreographed to the point where you’ll be upset that you don’t get these type of experiences at the movies. Whether it’s in a helicopter or a train, Lost Legacy seems intent on taking familiar experiences from previous Uncharted titles and cranking the intensity to a hundred, while making them feel completely new. They are nothing short of riveting. I can’t begin to explain how eager I am to revisit the entire experience just to witness those amazing sequences again. I was going to spend time talking about how uninteresting the villain was before writing this review until I realized he was a perfect antagonist to Chloe. Asav is upset with the new bloodline running rampant in his country of India, and wants to use the mythical Tusk of Ganesh to spark a civil war that will essentially reset his country. He’s angry and insane, and set in his ways. And while it’s a more intense version of what Chloe might have been in Uncharted 2, his aggressiveness presents a perfect parallel to Chloe. While Asav is keen on destroying India and ravaging the culture for his own selfish desires, Chloe legitimately cares about the culture and her heritage. By the end of the game, she is a selfless person determined to risk it all for her people, and undoubtedly a hero in every sense of the word. Asav never gets too much screen time, as he serves as more of an idea than a typical villain. But when he does appear, his ruthless monologues will shake you to the core. Nathan Drake’s story ended perfectly. While I never expected that I would want to revisit the series playing as anyone else, Lost Legacy made me realize that the franchise isn’t solely about him. There is clearly an entire world of characters, locations and mythical treasures to chase after beyond what we’ve seen in previous games. Naughty Dog’s writing is unparalleled, and managed to turn two side characters into some of the most interesting, well-developed characters I’ve had the pleasure of following in games. While the gorgeous vistas, incredible action sequences, and ingenious puzzles are to be commended, the true accomplishment here is the relationship formed between Chloe and Nadine. The story might not hit as high of a peak as any other core game in the series, but if this is a sign that we’ll be getting more Uncharted spinoffs in the future, then you can sign me up.